There is perhaps no more cherished theme among men than renewal, the hope that someday, whether by triumph of the human spirit, or Holy Spirit, each of us might rise above his or her failings and become a better person. 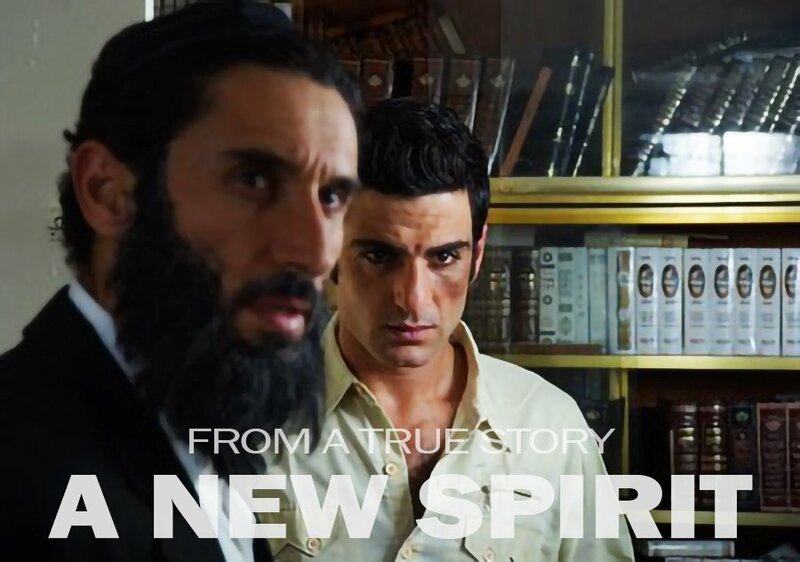 A New Spirit, a motion picture recently released in Israel based on the life of Israeli sabra and Messianic evangelist, Jacob Damkani, dramatizes a remarkable example of that process; how Damkani, once lost, found himself and his life’s work upon discovering the Jewish Messiah. If one were unfamiliar with religious conflict in Israel it might be difficult to understand how a reviewer might conclude that A New Spirit is about either Christianity or Orthodox Judaism. The film’s depictions of events are not generalizations about belief systems but dramatizations of Damkani’s personal journey. A New Spirit is Campbell’s hero’s story. Damkani’s common day was his former life as a confused, directionless young man and sometimes gangster. His region of supernatural wonder and the fabulous forces he encountered were the Tanach and the glory of God. Once hopelessly on the run in the United States, Damkani literally returned from a mysterious adventure to bestow boons—a personal message of the Jewish Messiah—upon his fellow Israelis. The film’s storyline is no different than that of Homer’s Odyssey, George Lucas’s Star Wars or thousands of other “hero stories” man has embraced since he first began to tell tales. And while it’s been said that everyone loves a hero, not everyone loves A New Spirit or its hero despite its uplifting message. The reasons why this is so are complex; that is, they are religious and political. In Israel, the word, Christian, is charged with more meaning than it may, at first, appear. In 1992, Israel’s High Court of Justice ruled that a Messianic Jewish couple living in the U.S. were ineligible for Israeli citizenship under the Law of Return because they had converted to a new religion; that is, officially, Jews who believe that Yeshua (Jesus) is the Jewish Messiah are Christians, not Jews. In August of 2017, the Rabbinical Court of Tel Aviv cited the high court’s 1992 opinion when it forbade Messianic Jews living in Israel—Jews in every way according to halakha—to be married as Jews in Israel because, again, it held that all those who believe in Yeshua are not Jews, but Christians. Given A New Spirit’s messianic message and Israel’s long history of opposition, the film’s appearance in Israeli theaters is nothing short of remarkable. Damkani is a well-known man in the land. As the founder of Trumpet of Salvation to Israel, a non-profit organization whose vision includes proclaiming “the Gospel in its Jewish context” and making “disciples, real followers of the God of Israel through studying his Word,” he has accrued many friends and enemies during a ministry now approaching forty years in duration. One of Messianic Judaism’s most vocal opponents in Israel is Yad L’Achim, an Orthodox organization established in Israel in 1950 “to help new immigrants adjust to [life in Israel] and to help them find a suitable religious framework… Over the years, its attention has turned to more complex problems, including how to counter the missionary threat… Fighting the missionaries… has long been one of Yad L’Achim’s top priorities.” (See, for example, “My Coffee Talks with Anti-Missionaries from Yad L’Achim,” by Hannah Weiss). In February of 2017, the Israeli National Museum in Jerusalem not only produced the exhibition, “Behold the Man: Jesus in Israeli Art,” it was well-received. “Israel does not yet have the capacity, desire or courage to distinguish between who Yeshua really is and what the Church has made of him,” Damkani told Kehila News. “The joy and light of salvation hit me when I became able to distinguish who Yeshua really is in the light of the prophets of Israel. But too many Israelis refuse to examine the prophets. A New Spirit is an inspiring film based on the extraordinary life of one of Israel’s evangelical pioneers. Whether it presents an anti-Jewish message, as some of its critics claim, or provides further revelation of the blessings in belief in the Jewish Messiah, Yeshua, should be left to its audience to decide. A New Spirit is now playing at Yes PLANET in Jerusalem and nineteen other venues in Israel. This article first appeared at Kehila News Israel and is reposted here with permission.